Traveling through New Zealand in a campervan felt very similar to our normal life in the US; driving to beautiful places where we can backpack. It was still a bit intense, for us anyway, to cope with all of the logistics required to accomplish what we wanted to do. Once we completed seven of the nine “Great Walks” we realized we were burned out and needed a break. What we needed was a vacation so we set aside our boots and backpacks and temporarily became tourists. 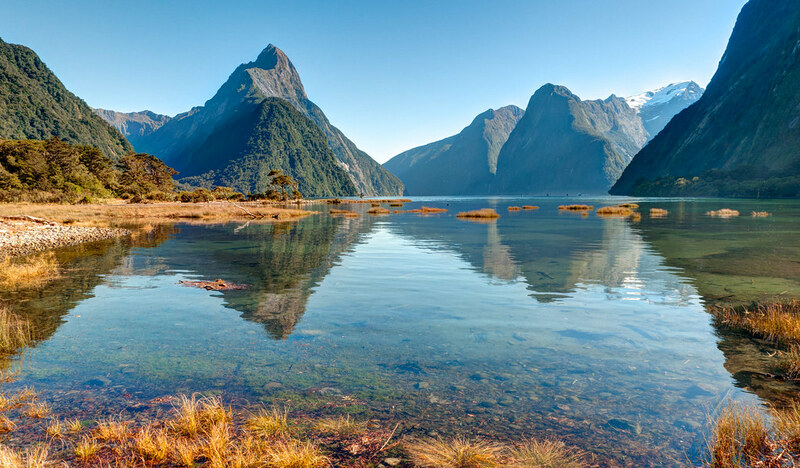 In addition to covering our time in Australia this post will cover the last two weeks we spent in New Zealand (I’ve already written about our adventures on the North Island and the South Island; the northern part and the southern part. 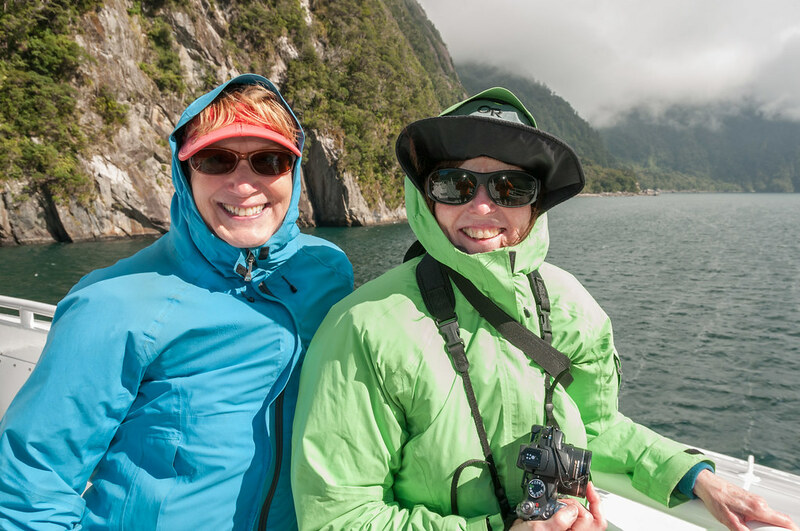 John’s sister Elizabeth joined us in New Zealand and the first thing we wanted to do was take a boat cruise on Milford Sound. 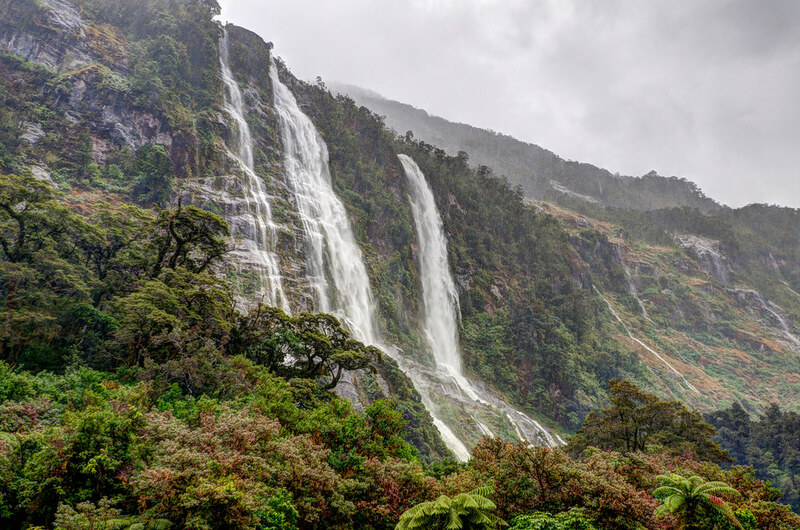 We had been told that Fiordland National Park is best seen in the rain and we can believe it after the stunning views of waterfalls we had on our last day on the Milford Track. However, Milford Sound was experiencing an extended period of clear, sunny weather so we had great views including Mitre Peak. It would have been nice if it had rained enough the night before our cruise to create the hundreds of waterfalls that this fjord is famous for and then clear up in enough during the day so we could see them. Nevertheless, we really appreciated the sunshine and lack of rain as it was quite windy on the boat. We also thoroughly enjoyed views we had of those waterfalls that are permanent including Lady Bowen Falls and Stirling Falls. 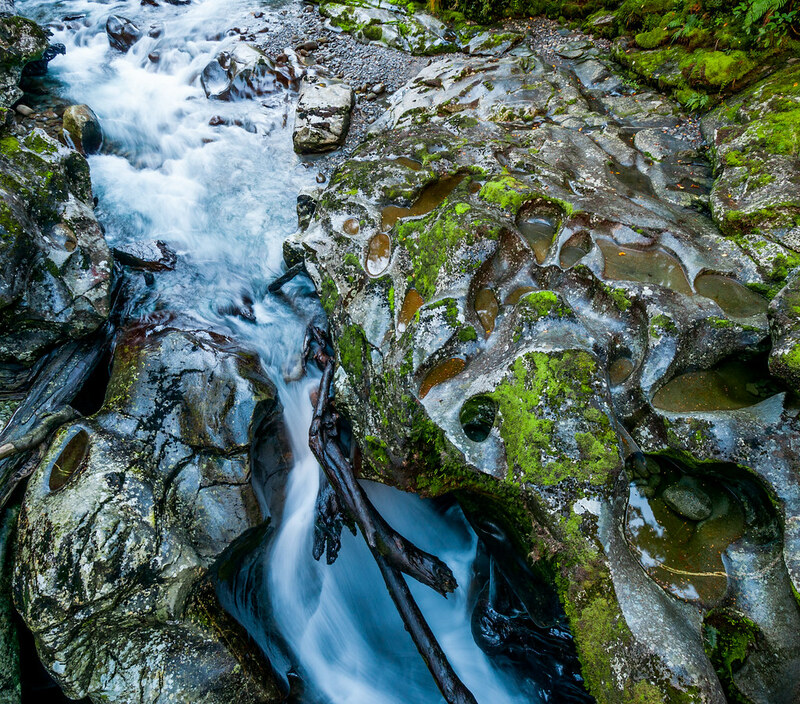 Another point of interest is the area is the Chasm, a shallow gorge where the rock has been carved and sculpted by the flowing water of the Cleddau River. 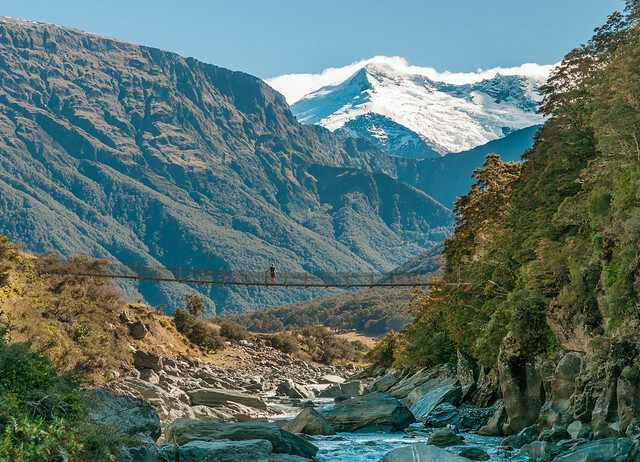 In the past the only ways to get to Milford Sound would have been by air, water or on foot by hiking the Milford Track. However, once the Homer Tunnel was completed in 1954 tourists were able to drive there. We were impressed by the fact that construction of this tunnel was first begun in 1935 by only five men working with picks, shovels and wheelbarrows. 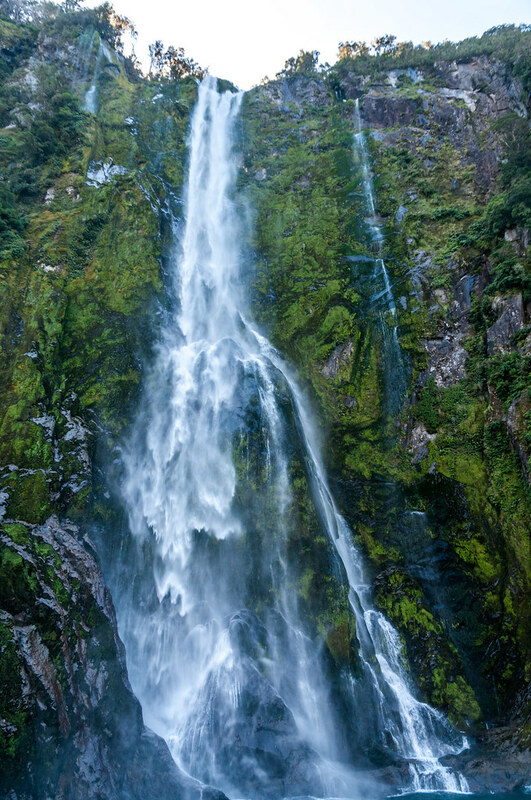 All of our Milford Sound photos are on Flickr. 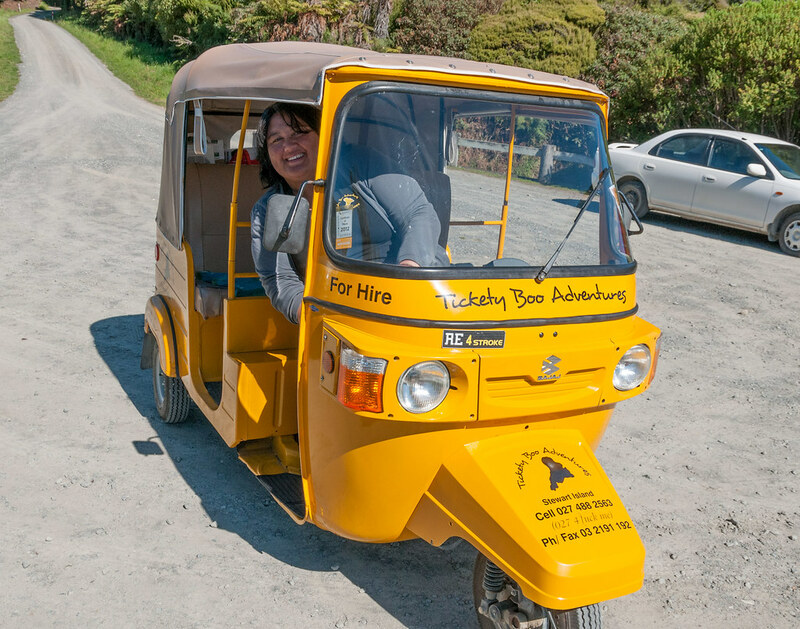 We didn’t have a lot of time but we wanted to give Elizabeth a look at some of New Zealand’s varied scenic beauty. But along the way there we took some contrasting side trips to see some notable glaciers. 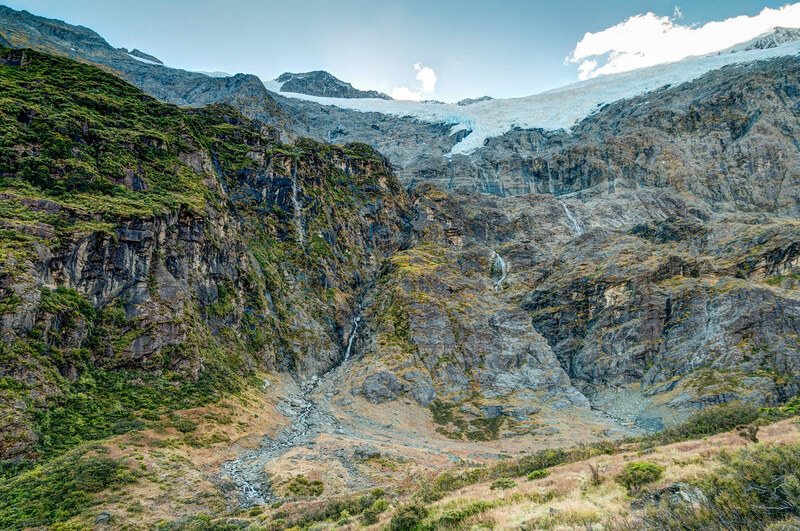 We first did the short hike on the Rob Roy Track in Mt Aspiring National Park. 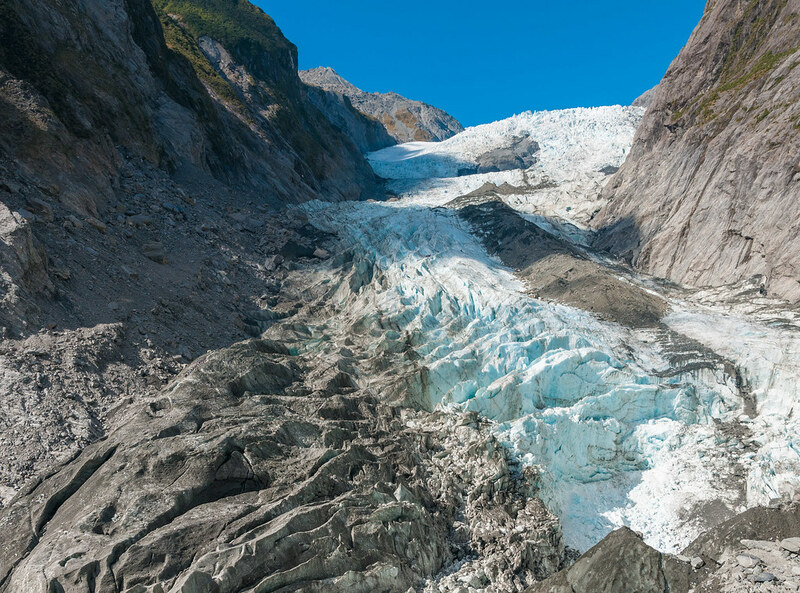 We also did quick visits to Fox and the Franz Josef Glaciers as well. Where else in the world can you get so close to such a large glacier on your way to the beach? 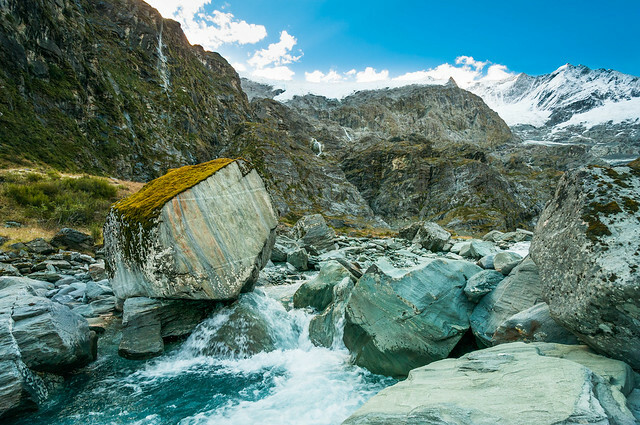 Our Fox and Franz Joseph Glacier photos are on Flickr. 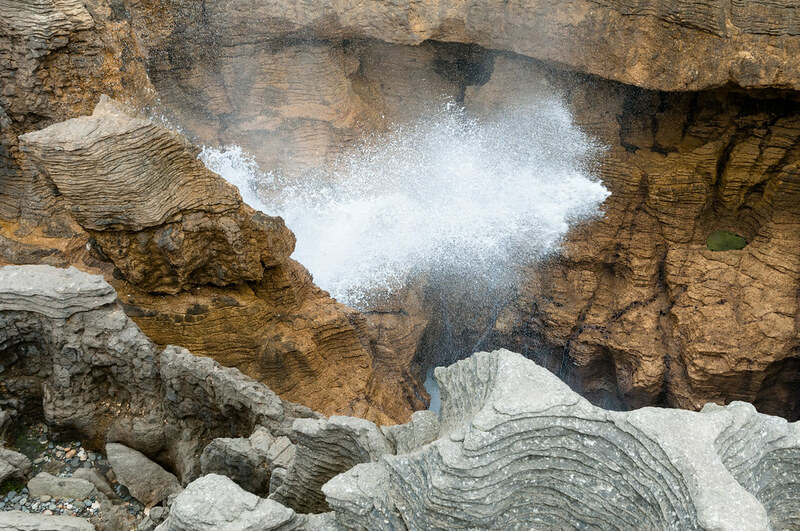 We continued up the west coast and stopped in Punakaiki to see the unusual “Pancake Rocks and Blowholes”. Once we reached Abel Tasman National Park a short water taxi ride enabled us to hike a portion of the Abel Tasman Coastal Track. 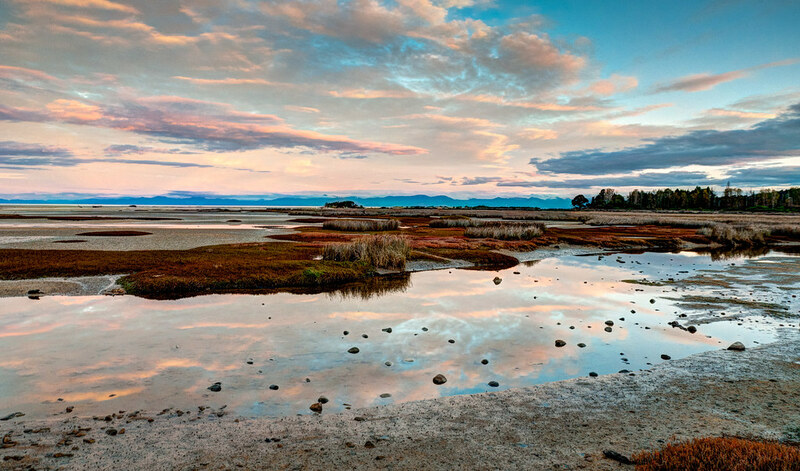 A short walk from Marahau provided great views of the beach and Tasman Bay. We then headed toward Christchurch in order to catch our flight back to Auckland (to catch our flight to Australia). However, on the way to Christchurch we encountered one of the most entertaining sights I have ever seen. 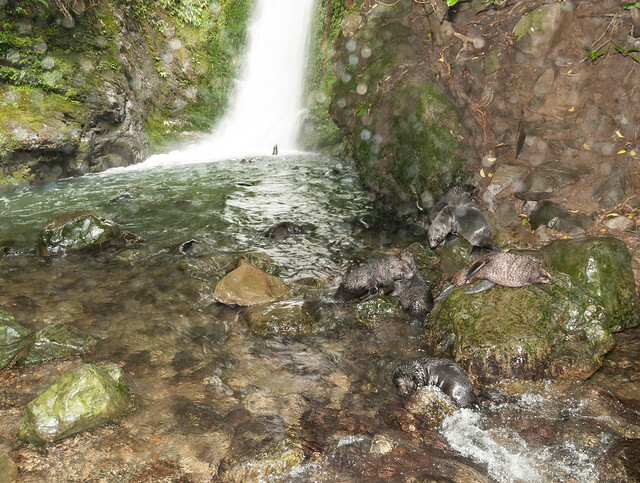 Just outside Kaikoura we did the short Ohau Waterfall Walk where we saw countless Fur Seal pups. These pups spend their days swimming and playing with each other while their mothers hunt in the ocean (or sleep in peace on the beach). It was a challenging situation for photography as it is quite shady and they move incredibly fast! However, there are many YouTube videos available that give one a better idea of what they do and this video is one of the best that I have seen. All of our Fur Seal photos are on Flickr. We spent our last evening in New Zealand walking around the “Red Zone” in Christchurch, the area most damaged by the earthquake in 2010. It is sad to see so much of a city cordoned off and buildings damaged and abandoned. 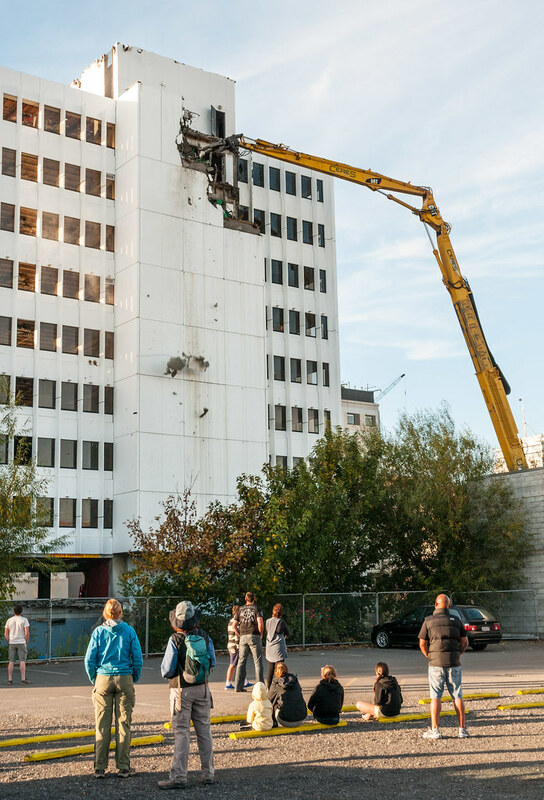 We felt a morbid fascination with watching heavy equipment, some resembling mechanical “dinosaurs”, taking down tall buildings one “bite” at a time. 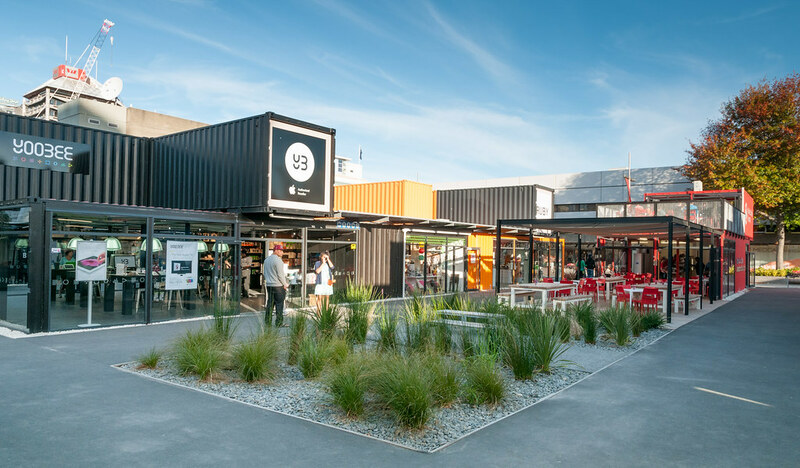 However there is an effort being made to revive the central business district with stores being housed in large (surprisingly attractive) shipping containers. All of our New Zealand photos are on Flickr including more photos of Christchurch. We then headed to Australia. Even though it is over 1,400 miles from New Zealand it is still relatively close so we decided to stop by. We allocated one month but were well aware that this was nowhere near enough time to experience the “real Australia”. So we did the common tourist thing and planned to spend our time on Queensland’s east coast. 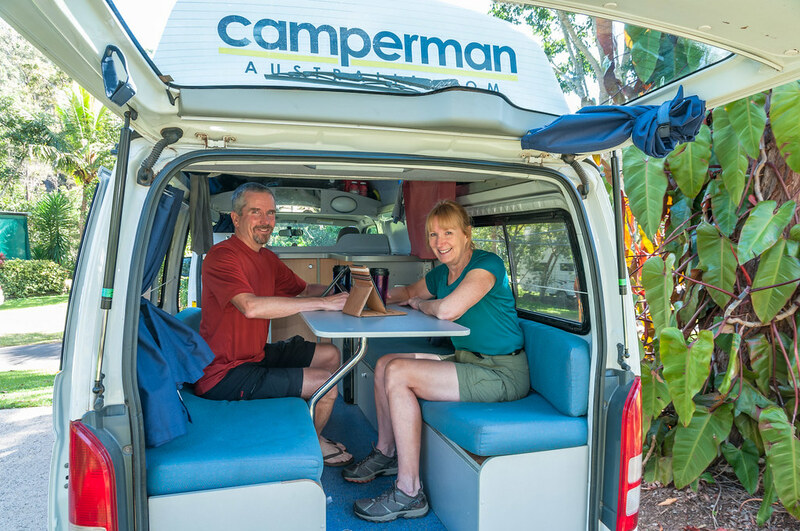 And as we had done in New Zealand, we rented a campervan. John’s sister Elizabeth was with us for the first week and we had two objectives, the first being to see some Koala Bears so we visited the Australia Zoo. 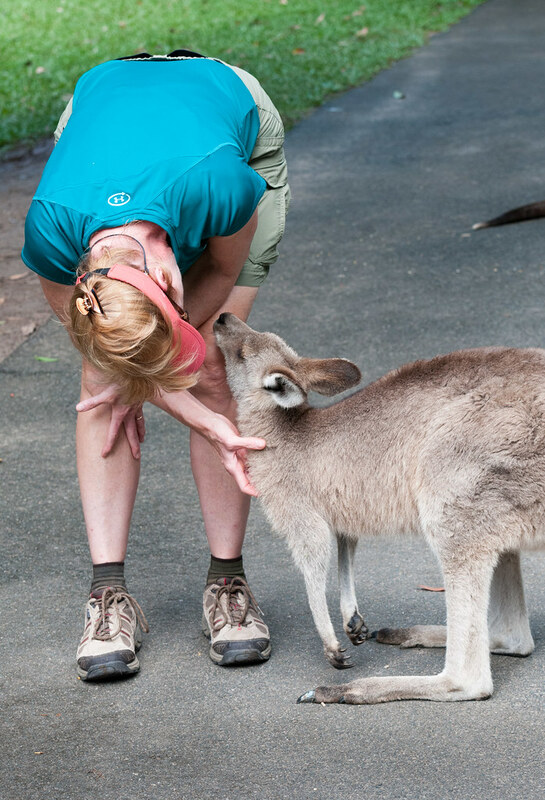 This zoo was founded by the parents of the late Steve Irwin, the enthusiastic conservationist best known as the host of the wildlife TV show, “The Crocodile Hunter”, and is a fitting memorial to him. 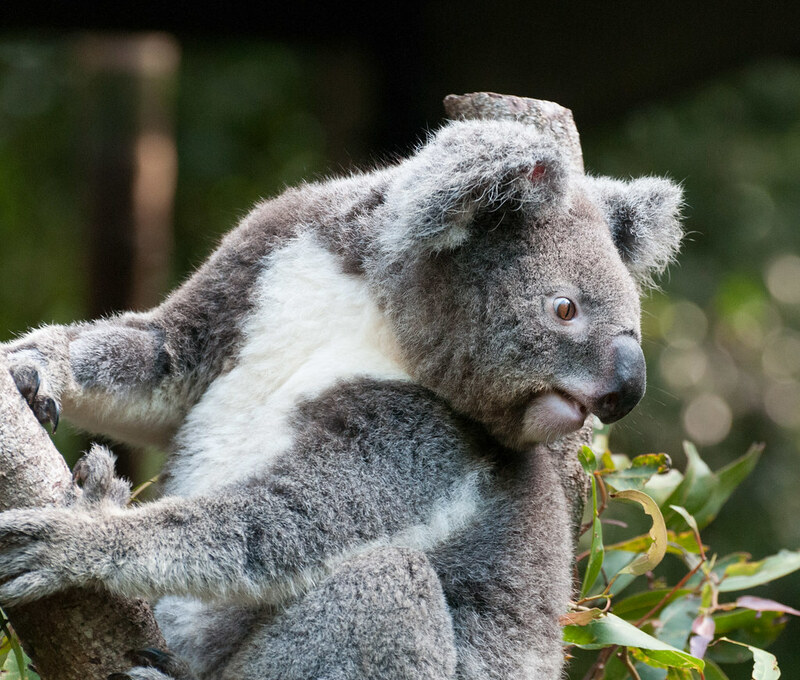 Watching Koalas in person is a bit mesmerizing but requires patience. They move slowly through the trees with “Zen like” calm. The one exception we saw was when one Koala, while climbing slowly down the trunk of a tree, accidentally sat on the head of another Koala that was clutching the trunk below. This affronted koala let out a surprisingly loud squawk. 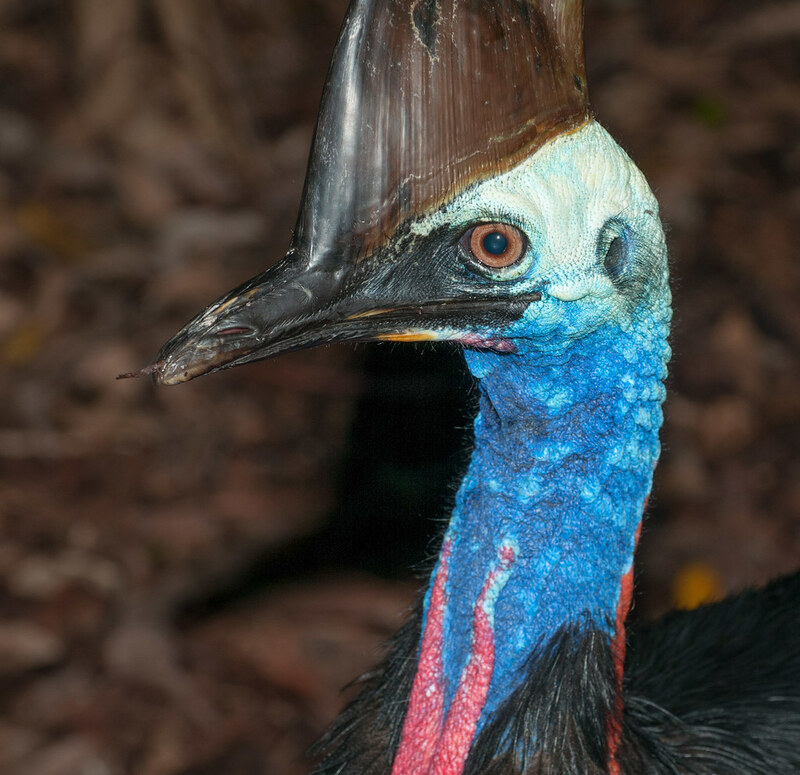 Perhaps the most flamboyant (and "liberated") creature we saw is the Cassowary. This stunning bird (which looks as though they are ready perform in Vegas) is the third tallest, some reach six feet tall, and only ostriches and emus are larger. The females are larger and more aggressive than the males and once they lay their eggs they abandon the nest and he is left to incubate and raise them. Meanwhile she goes off to hook up with another male ... just long enough to lay more eggs. A kick from their huge feet can kill dogs ... and people. Of course crocodiles take center stage at this zoo. We watched one of the “Crocs Live!” shows highlighting one of the Saltwater Crocodiles and “Casper” was the star that day. One thing we learned is that once a crocodile has identified their target they focus on that target and patiently wait for their opportunity. While we were sitting on the bottom row in the stands after the show I became aware that “Casper” was intently staring at me. Perhaps, of the three of us I looked the plumpest. My favorite exhibit was “Roo Heaven” which includes a large walk through enclosure dedicated to Kangaroos and Wallabies. 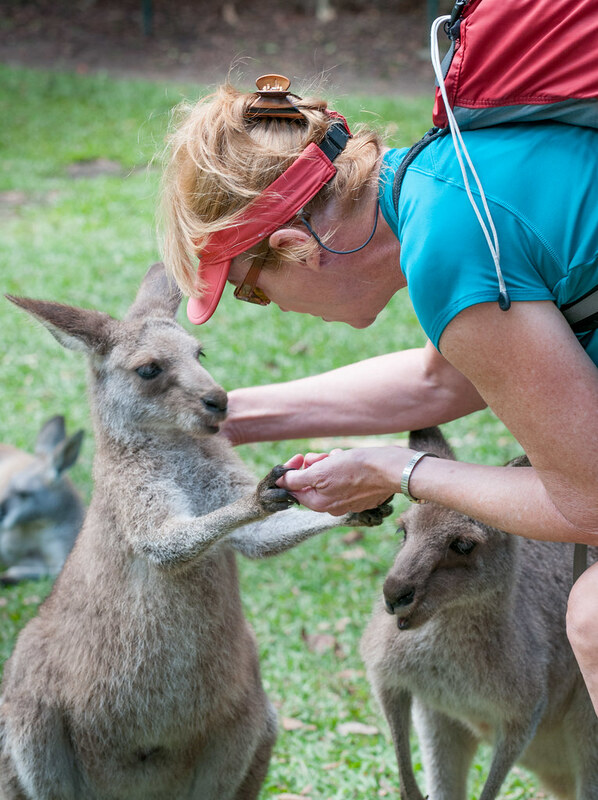 Visitors have limitless opportunities to interact with the animals, especially after purchasing a small bag of “Roo Food”. 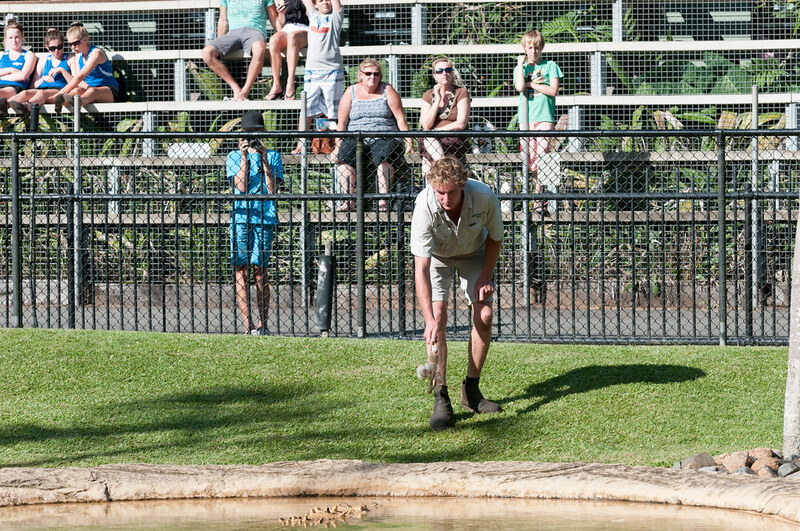 All of our Australia Zoo photos are on Flickr. 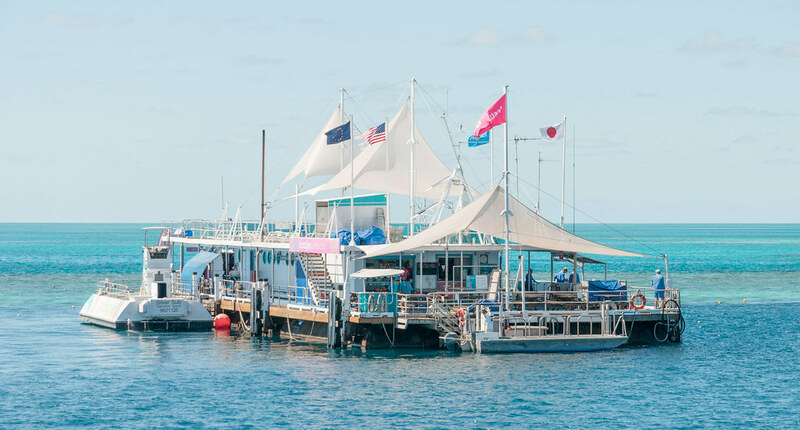 Our second objective was to visit the Great Barrier Reef so we took a boat out to one of the “Reefworld” pontoons off the coast of Arlie Beach. There were several options available for viewing portions of the reef. 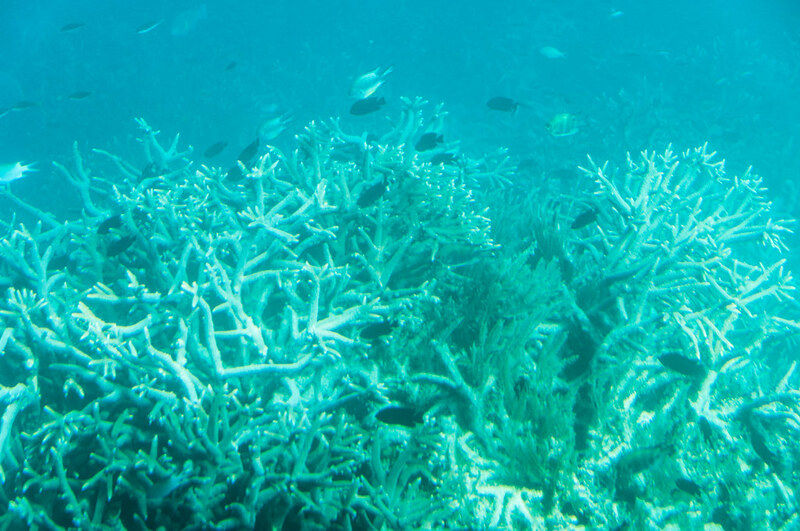 We opted to take the short ride on a semi-submersible boat for some limited views of the reef but it did not provide John with any good photo opportunities. However, we also did some snorkeling. John and I went out on our own while Elizabeth, this being her first time snorkeling, went with a guided group. 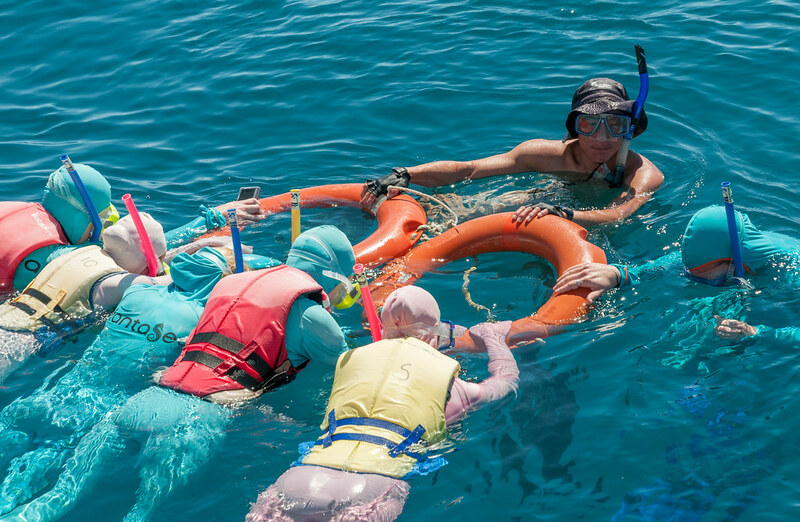 Due to the presence of “Stingers”, the local venomous Jellyfish, it was necessary for all of us to wear a “Stinger Suit”. Elizabeth made the observation that we all looked like “Teletubies”. John and I learned to scuba about 20 years ago and did a bit of diving off the coast of Hawaii’s Big Island so we were no stranger to beautiful coral and brilliantly colored fish. However, something we had not seen before were Giant clams which can measure nearly four feet across, weigh over 440 pounds and exhibit a wide variety of vivid colors. While it was interesting to explore the permitted area of the reef I believe that the most appealing aspect of this reef is its immense size. It is the only living thing on earth that is visible from space. Reefworld also offered a helicopter tour but I did not fully appreciate its value until we saw the reef from the air while on our flight home. This reef is definitely best viewed from the air. After Elizabeth left us we didn’t have any specific plans. 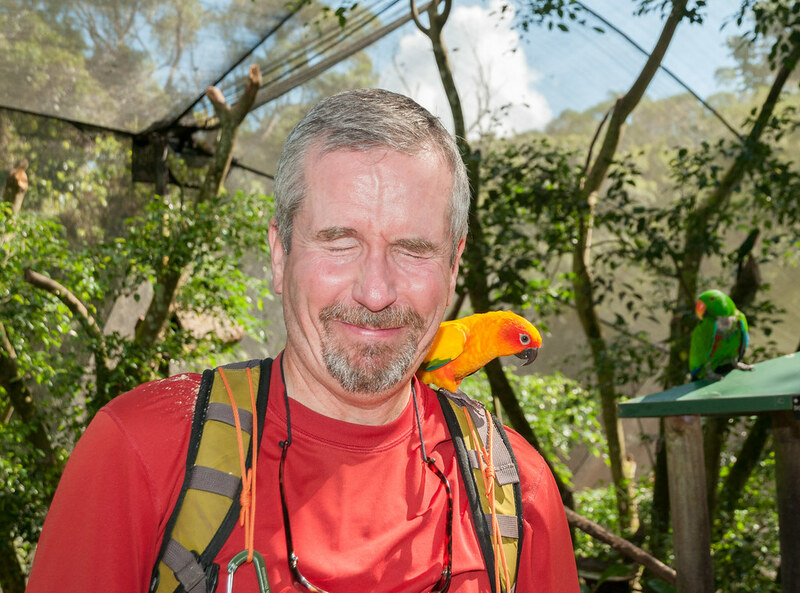 We considered seeking out opportunities to hike and backpack but the hot, humid weather in the wet tropics of Queensland completely zapped our energy and our motivation. While traveling we would seek out spots in shade with enough of a breeze so we could stop and eat in relative comfort. On more than one occasion we both ended up taking a nap which made us both feel guilty. After all, we were in Australia and here we were sleeping the day away. I was also intimidated by the large number of living things that wanted to hurt us; crocodiles, stingers, snakes, leeches etc, as well as trees that sting, ferns with sharp spines, razor sharp sedges etc. However, we did not encounter any of these (with one minor exception). What is ironic is that while we were in New Zealand, the land without “creepy crawlies” or anything that wants to kill you, we suffered far more from attacks by their voracious sandflies. So we continued our vacation and slowly headed north along the coast and continued to do more “touristy” things. To celebrate my birthday we visited the most unusual tourist attraction we have ever seen, Paronella Park. 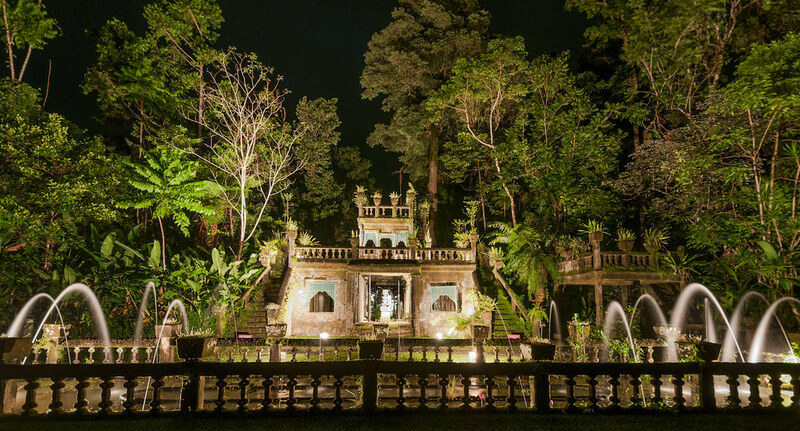 This improbable Spanish castle was built in tropical north Queensland by Jose’ Paronella and has a fascinating history. Unfortunately, incompatibilities between building materials combined with fire, floods and cyclones have led to much deterioration and damage to the original structures. In addition the lush surrounding vegetation is making a concerted effort to consume the remains. However the effect is not unappealing. It has lost much of what looks “man made” and gives the feeling that it “grew” out of the jungle. Paronella Park also provided us with one of the “creepiest” sights we have ever seen. 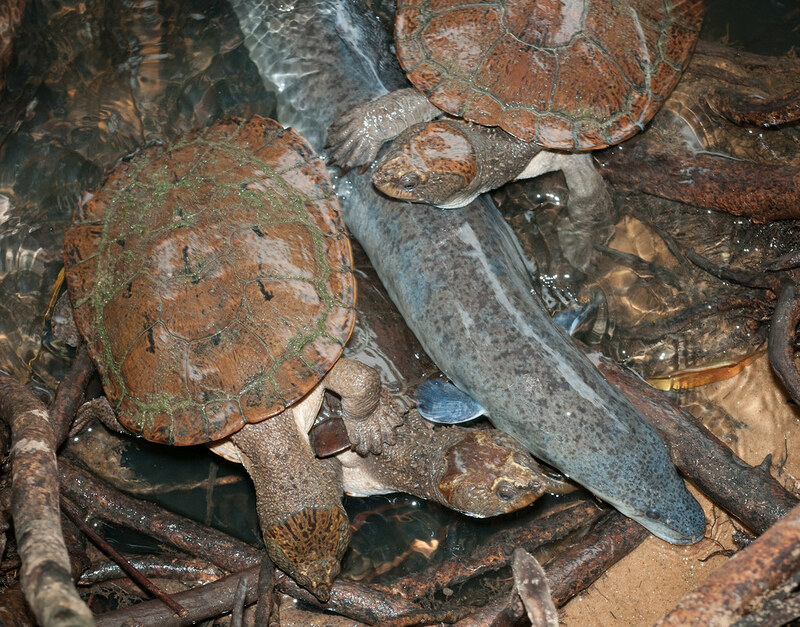 The nearby Mena Creek is home to snapping turtles and hundreds of huge freshwater eels. Visitors have the option of feeding them (the turtles eat quietly but the eels make a “slurping” sound when they eat). All of our Paronella Park photos are on Flickr. We also visited Wooroonooran National Park and took the Mamu Canopy Walk for an intimate view of this beautiful rainforest. 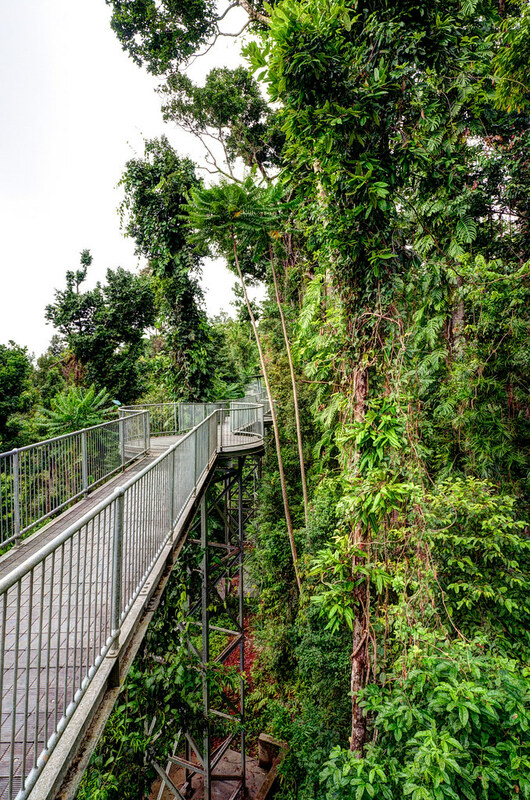 The extensive elevated walkway and viewing tower was built in 2006 after Cyclone Larry cleared a path through the jungle. As a result no trees needed to be removed. We then spent some time in and did a short hike from the Henrietta Creek campground to see Nandroya Falls. 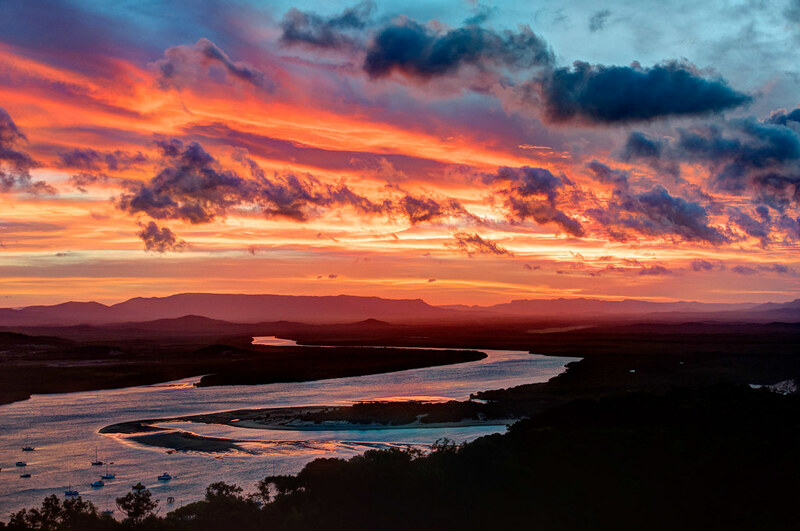 We were aware that rainforests were home to quite a few dangerous plants and animals and signs warned about the dangers of Gympie-Gympie trees, a variety of stinging trees. We had also been warned about leeches that are prevalent in wet vegetation. We were quite cautious when walking through any vegetation and felt fortunate to have completed the hike without being stung or bitten by anything. However, a short time later John walked through some short grass in the campground wearing sandals. Later on he noticed a “blood trail” on his foot – evidence that a leech had fed off him and left without his ever knowing about it (I think it bothered me far more than it did him). 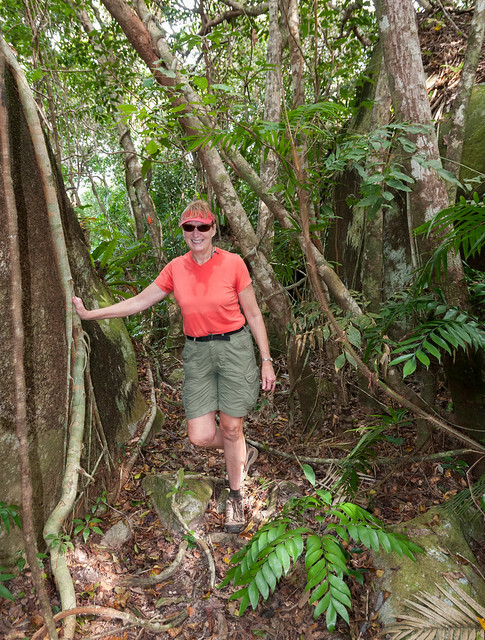 All of our Wooroonooran National Park photos are on Flickr. 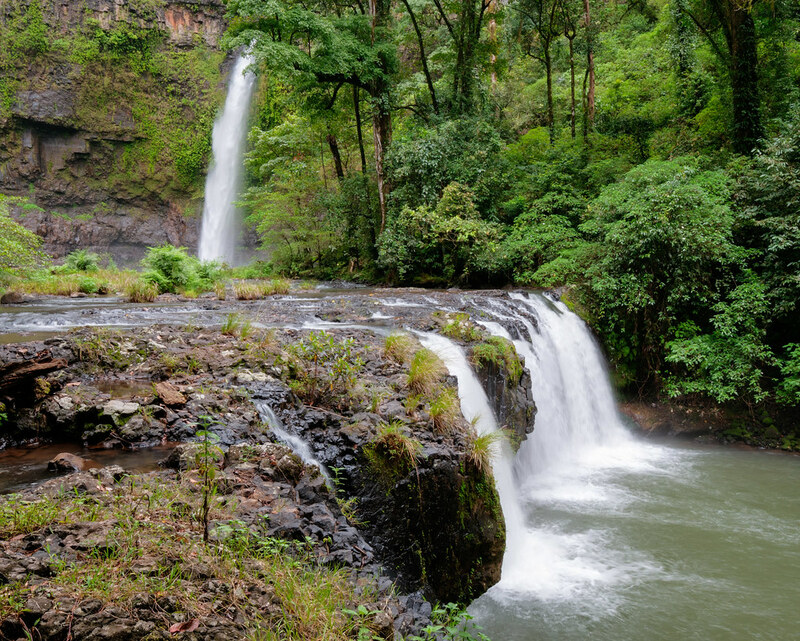 We drove up to the Atherton Tablelands seeking cooler temperatures at the higher elevation. We thoroughly enjoyed the quiet campground (as well as some free internet) and decided to stay a second night, and then a third … then a fourth. We spent time key wording photos from our New Zealand trip but Australia was impossible to ignore with wallabies hopping through our campground and Kookaburras “laughing” at us from nearby palm trees. … include over 600 specimens of crystals, gemstones and fossils. 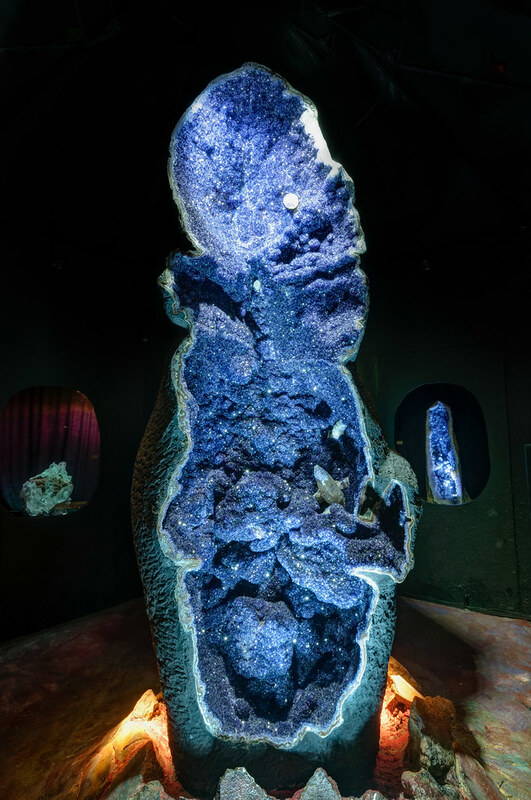 The star attraction is the “Empress of Uruguay” which, at 1 feet tall and weighing two and a half tons,is the world’s biggest Amethyst Geode. All of our Crystal Cavephotos are on Flickr. 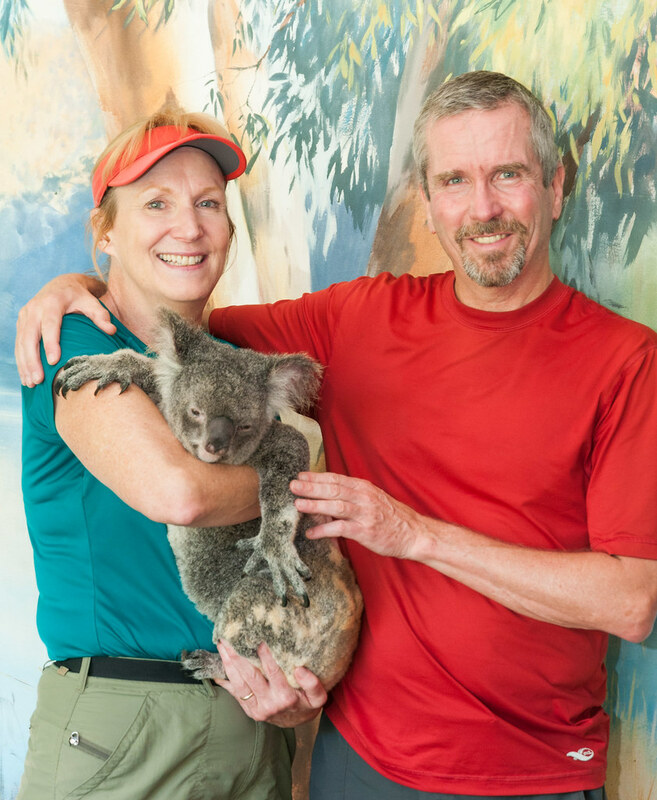 … as well as the option to be photographed holding a koala. Koala Gardens is home to a wide variety of reptiles; lizards, dragons and monitors. 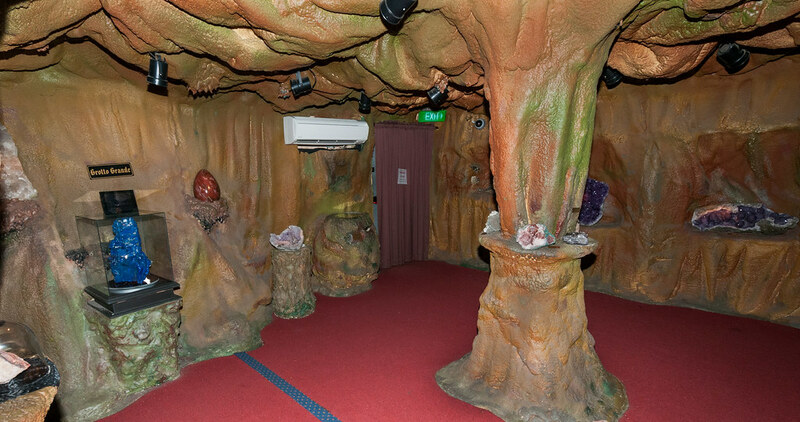 It also boasts having “Australia’s first walk through snake house”. Being within this enclosure was not a completely comfortable situation especially after two Keepers came in to feed the pythons and we became aware of how many snakes there actually were and how close they had been to us. We felt a morbid curiosity and stuck around long enough to watch the keepers feed every snake in the enclosure. 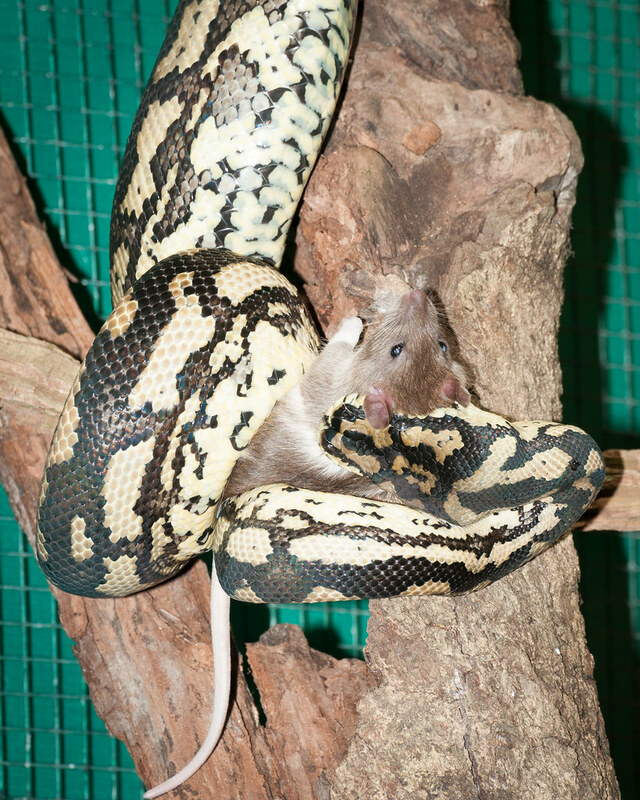 We were unable to take our eyes off these snakes as they slowly ingested the rats. 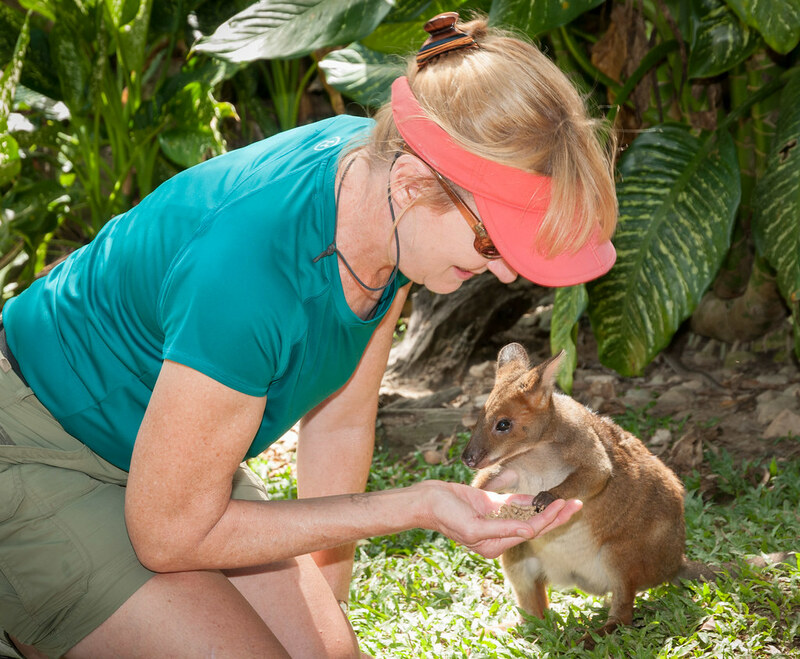 All of our Koala Gardens photos are on Flickr. We next entered Bird World, a large and completely chaotic aviary, which is home to about 80 different species, both native as well as imported. Visitors have the option of purchasing food and become popular with many of the birds especially the Macaws and parrots. The parrots and lorikeets also had a particular interest in anything “shiny” and women were warned to remove any jewelry. John discovered that some were even interested in cameras… and cameramen. All of our Bird World photos are on Flickr. The last exhibit we visited in the area was the Butterfly Sanctuary, a walk through aviary that is home to about 2000 tropical butterflies. 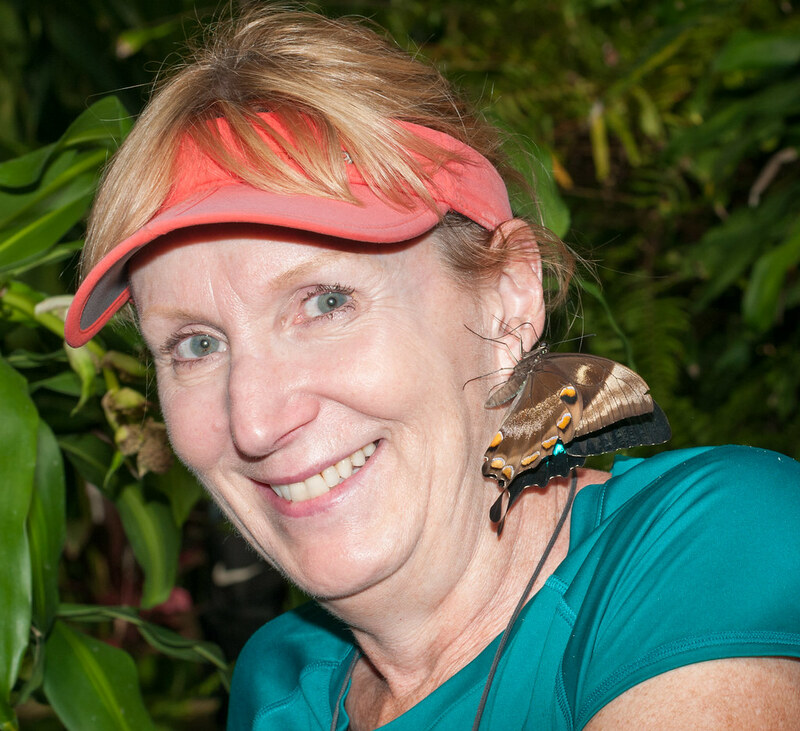 It was a bit disconcerting to have butterflies land on me and feel it poking around on my skin with its proboscis seeking nectar. Butterflies are not easy to photograph but John really tried. As a result we were the last visitors in the aviary at closing time. We had a momentary concern when trying to leave by the exit and found the door locked ... just as the automatic sprinkler system came on. Fortunately, a staff person heard us pounding on the door and quickly let us out. We had to forgo visiting the Australian Venom Museum as it had also closed at that time (but I wasn’t really disappointed). All of our Butterfly Sanctuary photos are on Flickr. 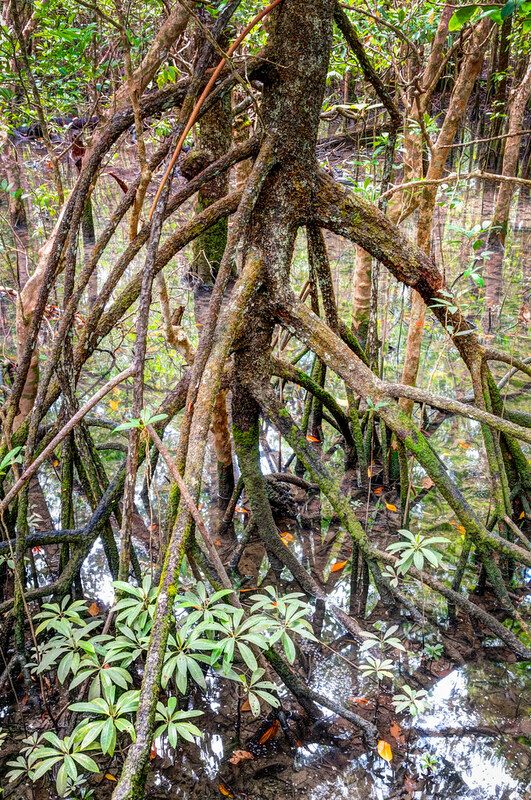 … and others have “buttress” roots. 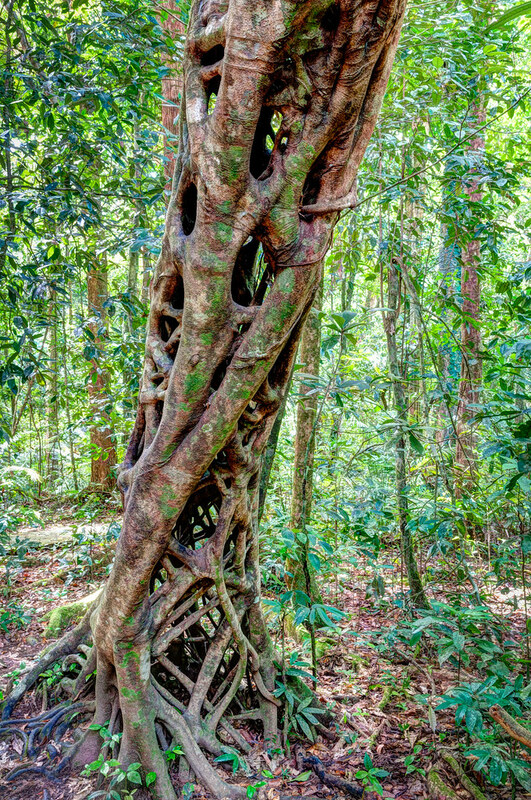 Also common are the parasitic Strangler Figs. 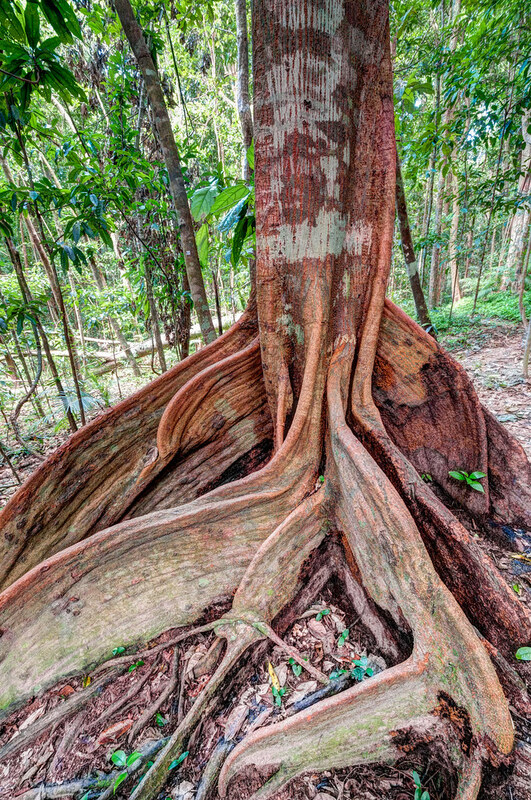 All of our Daintree National Park photos are on Flickr. ... as well as taking a short walk to the top of “Grassy Hill” for a fantastic sunset. All of our Cooktown photos are on Flickr. As we approached the end of our time in Australia we found ourselves becoming more excited about returning home. We were anxious to see how our motorhome fared after having been stored for four months. 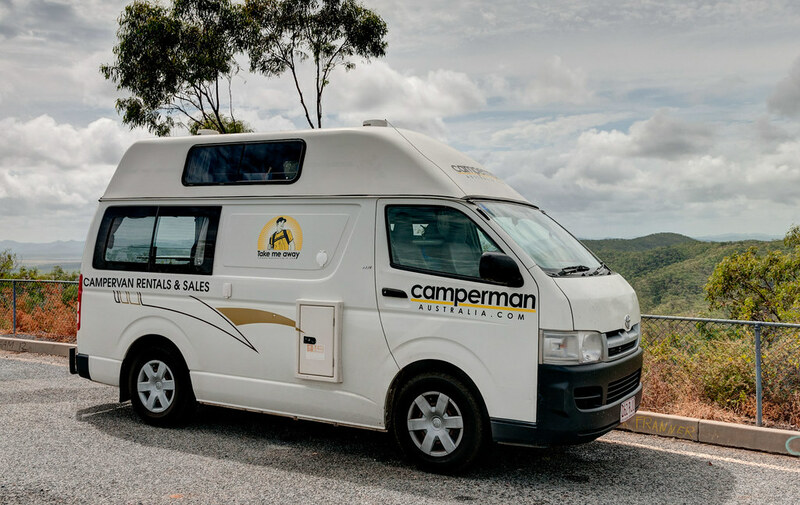 But primarily, after living and traveling in campervans for so long, we looked forward to the luxury and comfort of our home (not to mention driving on the right-hand side of the road). Home is wherever we’re parked! Once we returned home we spent about six weeks editing photos, posting them to Flickr and updating our blog. We got through nearly all of New Zealand before we decided we deserved a break. We spent time in Wyoming and Montana with our sons. 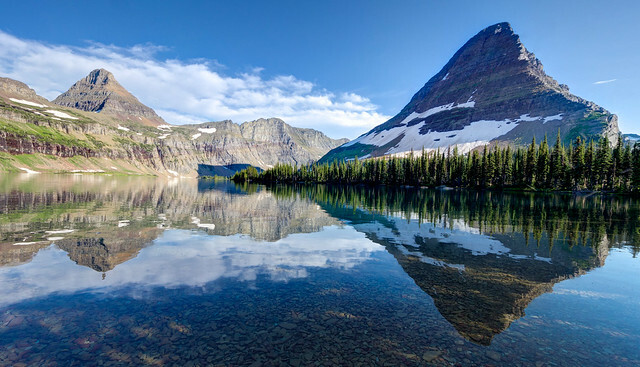 Then John and I did extensive backpacking in Glacier National Park in Montana as well as Grand Teton National Park and the gorgeous Wind River Range in Wyoming. We’ll eventually get those photographs edited and the blog updated. This next bit is just something that Jean has been thinking about. We have been fortunate in our opportunities to travel internationally. In 2007 we went to Tanzania and in 2008 we went to Nepal, both on tours offered by REI Adventures. In addition, back in 2003 John went to Patagonia on a trail running tour provided by Andes Adventures. 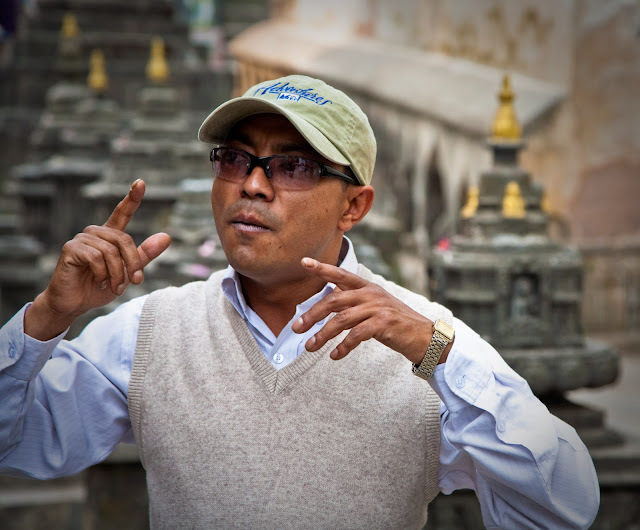 Not surprisingly all of our guides on these tours spoke excellent English. We want to do more international travel but our preference is to travel independently primarily because we prefer to not be locked into a specific itinerary. We want to have the flexibility to stop when John wants to take photographs as well as to wait out poor weather. We thoroughly enjoyed the freedom we experienced with our recent trips to New Zealand and Australia as well as our trip through Canada in 2010. This freedom to travel independently was made possible by the fact that we spoke the language of all of those three countries. At this point in time our next international destination is Peru, possibly in 2014. Going with a tour is definitely an option but we would really like to travel independently. To do that we obviously need to know some Spanish and that makes me very nervous. The problem is that neither of us know any other language besides English nor do either of us have a knack for learning languages. While John had some German in high school and some French in college he says both were essentially worthless. I had some French in high school with a teacher who spoke loudly and clearly, pausing between each word. I thought I could get the hang of it until we had a Student Teacher who had spent a year living in Paris. Her French sounded nothing like what we had been learning. When she spoke her words flowed smoothly together like a soft murmur and I couldn’t understand a word she said. I've even already had a bit of Spanish in elementary school but it was limited to simple vocabulary words. But when I have heard Spanish spoken by native Spanish speakers it sounds as though their words dance from one to another like lively music and bear no resemblance to what little I was taught. I once heard an educator speaking to Washington State Legislators about the challenges faced by non English speaking students in US schools. Her wish was that every adult would try to learn a new language so they too could experience the humiliation of being an adult who talks like a two year old. I think that may be the root of my fears. 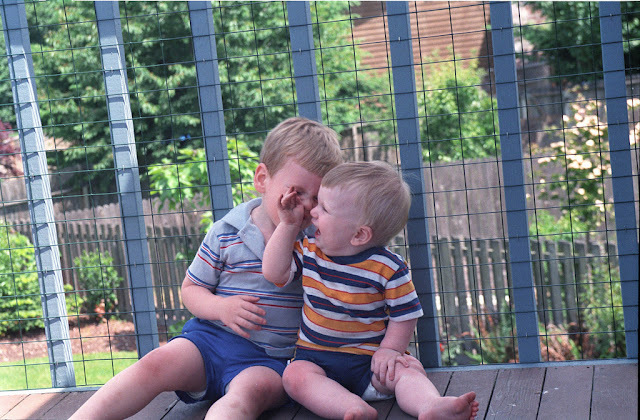 Of course when children are learning to speak they make many mistakes and oftentimes they are funny. I recently found this video where a little boy is playing with a toy fish and his mother tries to teach him to say “fish”. He begins by making the sound the letter “F” makes but ends up saying something quite different. When they are this age it doesn’t matter what they say, it’s always cute! Language mistakes made by small children, even the one made by the little boy in the video, are really cute. However, if a similar mistake is made by an adult it could be quite offensive to some individuals. While I am concerned about making mistakes in the choice of words, pronunciation and grammar, my greatest fear is that when trying to say something to someone in Peru in Spanish that I will inadvertently say something that will offend someone. What I have been hoping for is that advances in technology would come to my rescue. I can remember watching the first Star Trek series as a child and being fascinated by the Universal Translator, a useful device that magically enabled every character on the program, human and alien alike, to understand each other perfectly. More recently I have been excited by the advances being made toward having such a device in reality. For example, the Translation App available for iPhones and the Universal Translator that Microsoft has been working on. Unfortunately, no technology is perfect and mistakes are inevitable. For example, online services such as Google Translate, Bing Translator, capable of translating written text from one language to another, have yielded imperfect results. I read one account where writers for a BBC comedy apparently relied on Google Translate to translate a phrase on a tombstone from English into Hebrew. The phrase "dearly missed" was mistranslated as “pickled at great expense". However, despite these mistakes it seems to me that errors made by an electronic device would somehow be less offensive than if the same mistakes came out of the mouth of an adult human. 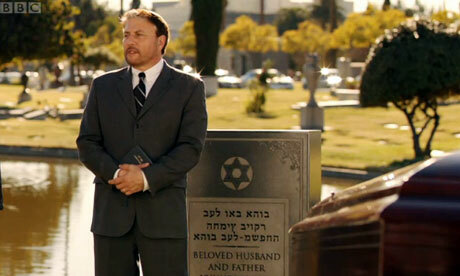 According to the Hebrew inscription on the tombstone the beloved husband and father was “pickled at great expense". However, there is something I need to remind myself of, the fact that countless individuals do travel independently to countries where the language spoken is different than their own. And they do it without the benefit a “Universal Translator". Throughout our travels, abroad as well as in the US, we have met several such individuals. While they all possessed differing levels of expertise in speaking English we rarely had trouble understanding what they were trying to say. I am really impressed by that because I’ve heard that English is one of the more challenging languages to learn and I can believe it. Some of it just doesn't make any sense. For example, English contains words that sound the same but are spelled differently and have completely different meanings; weight and wait etc. There are also words that rhyme with each other despite having completely different (as well as very confusing) spellings; some and numb etc. In addition, there are words that even though they are spelled the same except for the first letter, they don’t sound anything like each other; laughter and daughter etc. 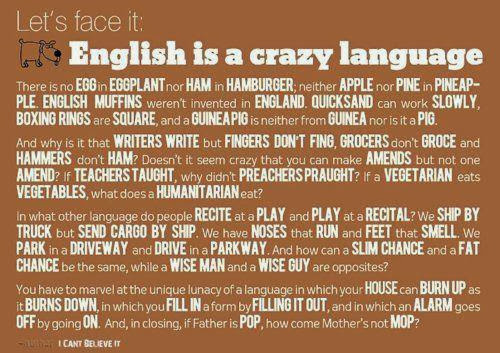 I am reminded of an entertaining comedy routine performed by Gallagher highlighting just a few of the confusing characteristics of the English Language. I have to agree with him when he asks “Why should I be serious about the language if the language isn’t serious enough to make sense”? And if that doesn’t make learning English complicated enough there is the fact that the language spoken by people in all other English speaking countries contains some notable differences in accents, pronunciations and word choice. While I have never been to Great Britain I am familiar with the sound of British English having enjoyed watching BBC programs and listening to the BBC News. 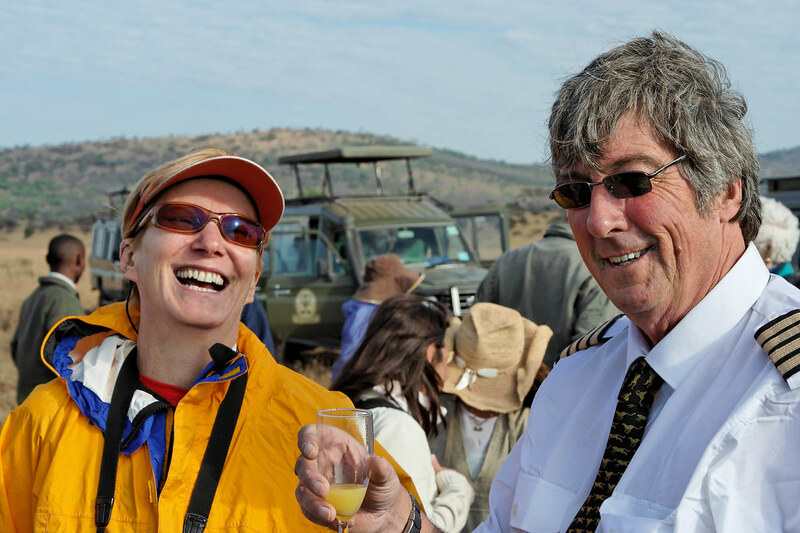 As a result we had no trouble understanding “Colin” our British Balloon Pilot in Tanzania. 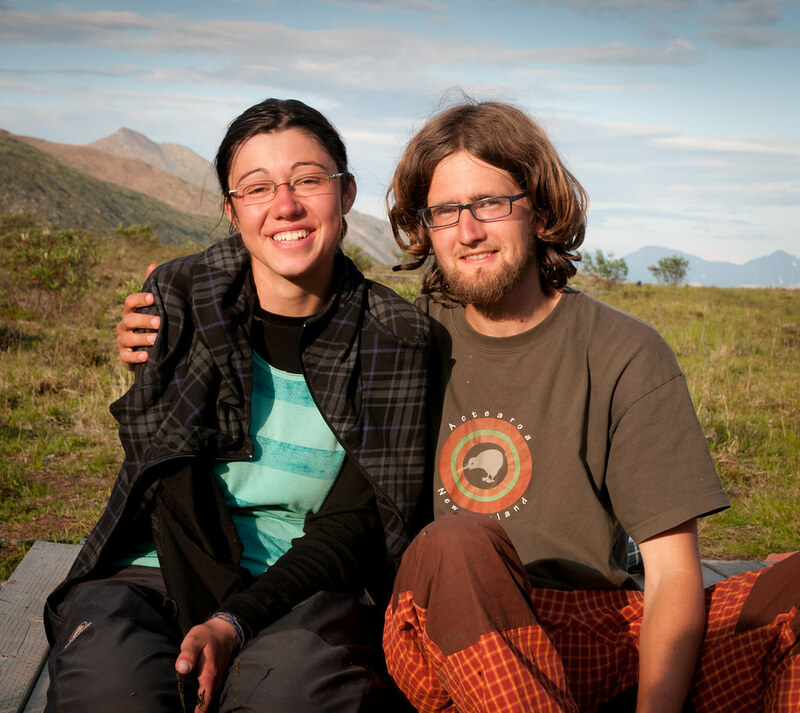 In 2010 we spent six weeks traveling through British Columbia and Yukon. Canadian English is reported to be a combination of British English and American English. However, I found that the Canadians we met in British Columbia and Yukon spoke with an accent that was almost indistinguishable from our own Pacific Northwest US accent. Jean and her new “friend” in the Fort Nelson Museum, British Columbia "speak" the same language with a similar "accent"
When we arrived in New Zealand we knew that New Zealand English would be similar to British English but even to our inexperienced ears their accent sounded livelier, more cheerful and less formal. We immediately noticed differences in the choice of words used as compared to the US. 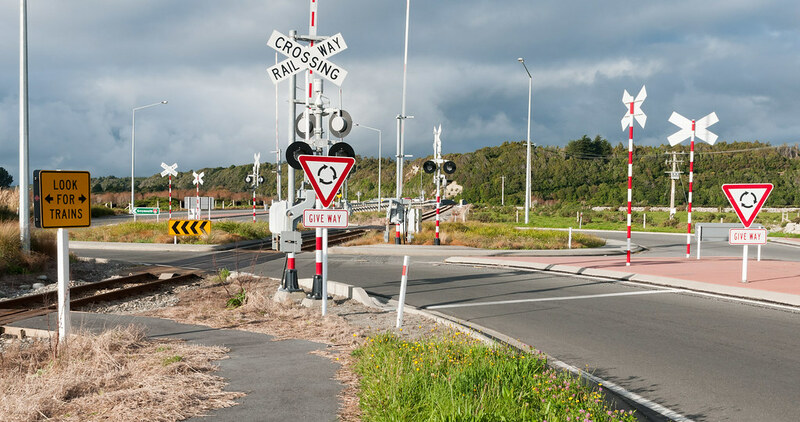 For example, signs said things such as “The Way Out” rather than “Exit”, “Please give way” instead of “Yield”, “Please stop upon request” rather than “Prepare to Stop” or “Flagger Ahead”. The overall effect was that the instructions on these signs sounded “softer” and more polite to us as opposed to the curt commands on US signs. It could be that these same phrases are used in Great Britain as well but we came to think that these were symbolic of the differences we observed between the Kiwis we met and aggressive Americans we have known. We didn’t pick up many Kiwi words and phrases but we quickly learned to refer to “trails” as “tracks” and “hiking” as “tramping”. Of course we knew that a “rubbish bin” is the same as a “trash can” and it was easy to figure out that a “trundler” was the same as a “shopping cart”. 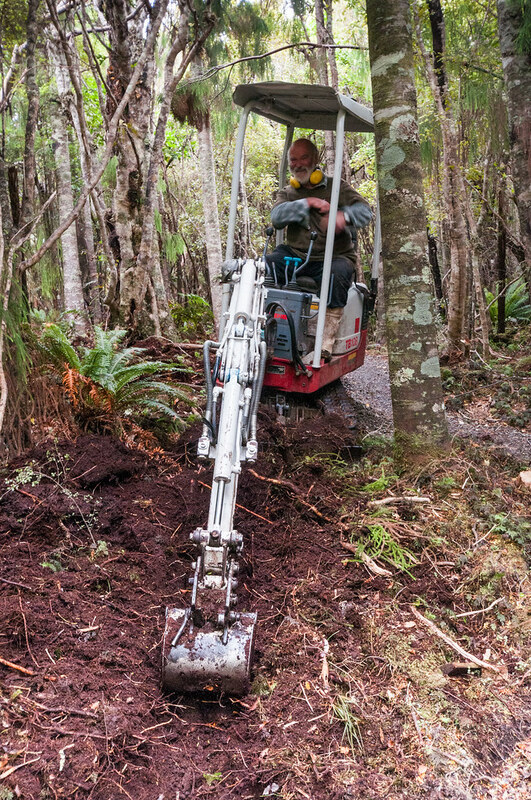 However, we were perplexed when a fellow we met doing trail maintenance told us that he had previously worked as a “Joiner” until he was “made redundant”. We soon learned that meant he previously built furniture until he was laid off from his job. To further complicate it is the fact that every English speaking country contains different dialects. For example, there are several regional differences contained within the “American English” spoken in the US. Whereas, I grew up just outside of Louisville, Kentucky and speak “Midland American English”, my father was born and raised in the Appalachian Mountains of eastern Kentucky and spoke “Appalachian English”. I briefly attended a university in eastern Kentucky and had classmates from the mountains who spoke with the same Appalachian accent so I had no trouble understanding them. However, I had an English Professor who was British and not only did he have difficulty understanding what these students said, they had trouble understanding him. So on multiple occasions I had to serve as an “interpreter” for them. … at least not yet. It is such a privilege to be able to visit another country so it seems to me that the very least we can do is try to learn some of their language. Therefore, as we really want to go to Peru and we hope to travel independently, it is obvious that we should start learning some Spanish. Our first step has been to purchase Fluenz (our next step will be to actually try it out). Another option we are considering is to attend a Language Immersion School. Then the best thing to do is create opportunities to practice what we have learned and I can’t think of a better place to do that than in Peru. I know I’m going to make many mistakes so I’ll make a point of learning how to say important words and phrases such as “please”, “thank you”, “excuse me” and “I’m sorry” (not to mention … “where is the toilet?”) correctly. I also need to accept that individuals in other countries will be patient with us and appreciate our willingness to at least try. I do hope that I never inadvertently say anything offensive but undoubtedly they will understand that it was not intentional. And if I say something really embarrassing … well, I'm okay with providing someone with a good laugh but I do hope that no one records it and posts it to YouTube.